Tiwari, V., Singh, A. (2014). Evaluation of Anti-hyperglycemic potential of Bauhinia Tomentosa standardized extracts in streptozotocin- induced diabetic rats. Iranian Journal of Pharmaceutical Sciences, 10(1), 1-14. Varsha Tiwari; Anita Singh. "Evaluation of Anti-hyperglycemic potential of Bauhinia Tomentosa standardized extracts in streptozotocin- induced diabetic rats". 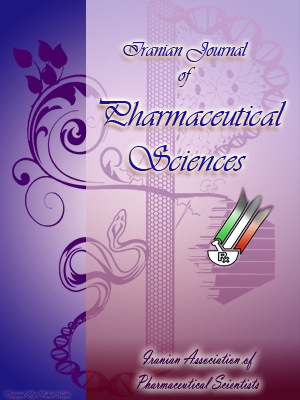 Iranian Journal of Pharmaceutical Sciences, 10, 1, 2014, 1-14. Tiwari, V., Singh, A. (2014). 'Evaluation of Anti-hyperglycemic potential of Bauhinia Tomentosa standardized extracts in streptozotocin- induced diabetic rats', Iranian Journal of Pharmaceutical Sciences, 10(1), pp. 1-14. Tiwari, V., Singh, A. Evaluation of Anti-hyperglycemic potential of Bauhinia Tomentosa standardized extracts in streptozotocin- induced diabetic rats. Iranian Journal of Pharmaceutical Sciences, 2014; 10(1): 1-14. In India, the occurrence of diabetes mellitus is on increase and needs to be addressed properly. Herbal remedies are considered most suitable for the management of type 2 diabetes due to their traditional acceptability and availability, low costs, and fewer side effects. Traditionally Bauhinia tomentosa L. (Family- Fabaceae) is used in the treatment of diabetes in India. Aqueous extract and alcoholic extract (250 and 500 mg/kg) of stem were taken to evaluate the anti-diabetic activity in normal and streptozotocin (65 mg/kg) induced diabetic rats. After 21 days of oral administration of extracts resulted in the significance reduction in blood glucose level. Serum biochemistry showed that serum cholesterol, triglyceride, HDL, LDL levels were significantly decreased by both the extracts and standard drug glibenclamide (10 mcg/kg). HPLC and HPTLC analysis of alcoholic extract found to be rich in flavanoids and phenolic constituents whereas aqueous extract found to possess rich in flavanoids, phenolic constituents, tannins and glycosides. The antidiabetic activity of Bauhinia tomentosa L. may be attributed to its high phenolic and flavanoids constituents.